1. I've heard some people say they were having issues when importing leads from Excel. Is there any issue with the GUID that gets created? 2. I need to maintain Name-Value pair while creating custom fields. For example, when I choose, RANK 1 in a custom picklist, the corresponding value 1 needs to be stored, and if I select RANK 2 in the custom picklist, the corresponding value 2 needs to be stored. 3. What are Business Units for and when do we create them? 4. When creating a contract template, how does the calendar effect the contract, and how is it used in the Customer Service module? 5. What is the Subject Manager used for? 6. What is the advantage of using CRM’s Sales Literature function when I can attach documents to objects using Notes? 1. I am not familiar with any issues with importing leads from Excel. Many end-users however are not familiar with the concept of mapping, and may require some training with this. 2. When you create a custom picklist in CRM you are actually adding two fields to the database: one field stores an integer that corresponds to the value, and the second field holds the value. So you will see when adding the custom picklist to the form, as you add or remove values, they will have an integer associated with them. 3. You will need at least one Business Unit. There is a business unit created when you install CRM. You might create additional Business Units if the company has a sales division and a production division, or if you have an Asia Business Unit and a Europe Business Unit. Basically, you want to draw an organizational chart for the company and then try to get CRM to replicate the org chart. Business Units can help you do this. You can also use territories within Business Units. Also, security roles can be adjusted to add or remove privileges by Business Unit. 4. The calendar in the contract template is there basically to allow you to show what times the contract is in effect. For example, if you provide a service contract for support during normal business hours, you can enter the hours in the calendar. If you provide support 24 hours a day, 7 days a week, check the 24x7 box. I don’t believe there is any programmatic functionality involved with this. It just is there for to provide information to the users. 5. The Subject Manager is a good place to set up topics that your business covers in the Customer Service portion of CRM. For instance, we use the Subject Manager to add items that we take support calls for. This allows us to run reports to see how many service cases were created for Network Access support, or printer support, or Windows update support, etc. These subjects are also available from the KB Manager, so you can write KB articles keyed to a certain subject. 6. Sales Literature is basically just a storage place at this point. 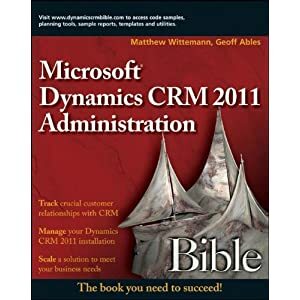 We use SharePoint to store our sales literature, since you can’t even E-mail articles from CRM’s Sales Literature module. But one of my clients does use Sales Literature as a convenient place for all of their reps to find PDFs of brochures, stored by product category. Can we send SMS directly from MS CRM to any mobile number in any country? Does MS provide any tool for SMS integration with MSCRM? Can you throw more light on this? How can we add any picture of customers on MS CRM?